Rachel Matthews isn’t one to rely on others to take care of her. Homeless and alone, she still wants to make her own way and her own money to buy back the family ranch–even if she’s forced into the life of a dance hall girl. Horrified by her circumstances, Rachel’s brother, who is away mining for gold, sends a friend to rescue her. Cattle baron John McIntyre is focused on acquiring as much land as possible in Montana and has little time to deal with a dance hall gal. Rachel isn’t sure she can take one more day in John’s home–especially once she discovers that he’s the one who holds ransom the key to her family’s future. A Sweet Misfortune is a charming story! John and Rachel made my smile, and I thoroughly enjoyed their story! One of my favorite things about this novel is the wonderful characterization. Primary and secondary characters alike are well-crafted, and they endear themselves to the reader throughout the narrative. The story line comes alive with humor, drama, and romance, making this heartwarming historical a pleasure to read! 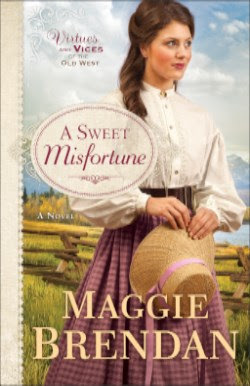 Maggie Brendan continues to delight fans with her Virtues and Vices of the Old West series, and I look forward to the next adventure! Maggie Brendan is the CBA bestselling author of the Heart of the West series and the Blue Willow Brides series, as well as The Trouble with Patience. Her books have received the Book Buyers Best Award from the Orange County Chapter of Romance Writers of America and the Laurel Wreath Award. She lives in Georgia.